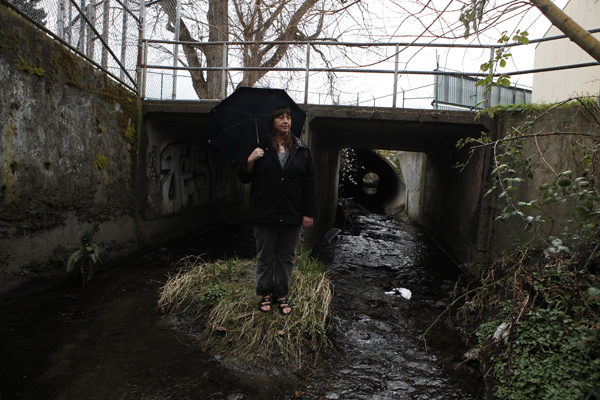 Jody Watson of the Bowker Creek Initiative cleans up trash while checking out a culvert. Chad Hipolito photographs for the Globe and Mail. 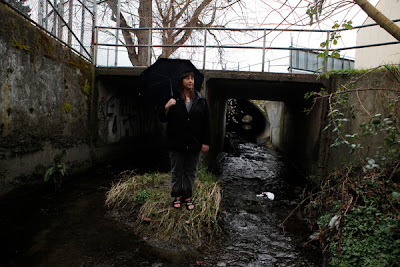 The creek running behind Oak Bay High emerges from a culvert and streams along concrete channels before continuing to the sea. Over a century, Bowker Creek’s natural path has been piped and paved, boxed and walled with concrete. Once in a while, students climb down into the channel to fish out rusty cans, plastic pop bottles, discarded shopping carts and other detritus of urban life. The high school’s campus is pleasant enough — a creek runs through it — but the waterway is far from being in a natural state. It has no fish. The creek banks are bereft of a native riparian habitat — choked by invasive yellow willow and Himalayan blackberry. On Friday, the federal government announced it will provide $738,000 for a project to restore the section of the creek running south of the school. The news was greeted warmly by those who have been working on a long-term plan to rehabilitate the 8-kilometre-long creek. The headwaters of the creek can be found on what is now the University of Victoria campus, where storm runoff joins spring water. The stream runs through three municipalities, as well as near the grounds of Hillside Mall and Royal Jubilee Hospital. The creek originally followed a sinuous path to Oak Bay, a downhill journey now mostly hidden in culverts and storm drains. Less than one quarter of the creek is in an open channel. The creek once provided drinking water for the Coast Salish peoples, who also fished coho salmon and cutthroat trout. Archaeological digs have uncovered shell middens (refuse heap) near Willows Beach and what is now Fireman’s Park. These are at least 2,500 years old. After the founding of Fort Victoria, settlers began farming in the areas near the creek. The stream first appears on a Hudson’s Bay Company map in 1855, when it was labelled Tod’s Creek after John Tod, whose original farmhouse still stands at 2564 Heron St. It later carried the grand name Thames River before becoming known as Bowker Creek after John Sylvester Bowker, a farmer who married one of Mr. Tod’s daughters. 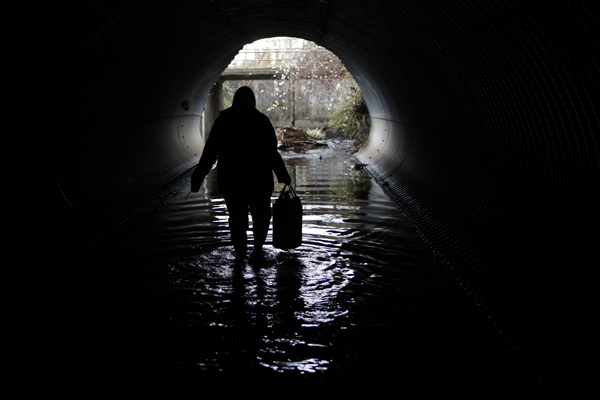 Over the years, the creek’s tendency to flood led to calls to control its outpour. Even the creek bed is covered by concrete and asphalt along some stretches. Of course the fish disappeared. Some 30,000 people now live in the watershed, about half of which is covered by such impervious materials as roofs, streets and parking lots. At the high school, the creek will be returned to a more natural state with a meandering channel. The invasive plants now growing along the banks will be replaced with native species. Out goes yellow willow, in comes Pacific willow. While the design has yet to be completed, it is expected viewing terraces will be incorporated into the rehabilitation of the north bank on the high school grounds. Not only will passersby be able to enjoy the creek’s bucolic splendors, but it is hoped that future classes of students will monitor water flow and study the creek as part of classwork in freshwater biology. Students will be creek stewards. The funding announcement comes soon after the municipalities of Saanich, Victoria and Oak Bay accepted a proposal called the “Bowker Creek Blueprint,” which outlines a 100-year plan to restore the watershed. That’s right. One hundred years. It took a century to cover the creek and it will take another century to restore it. This is Year One. You might call it a watershed moment. Bowker Creek has been boxed and diverted into pipes and culverts over the past century. It will take another 100 years to return it to a more natural state.